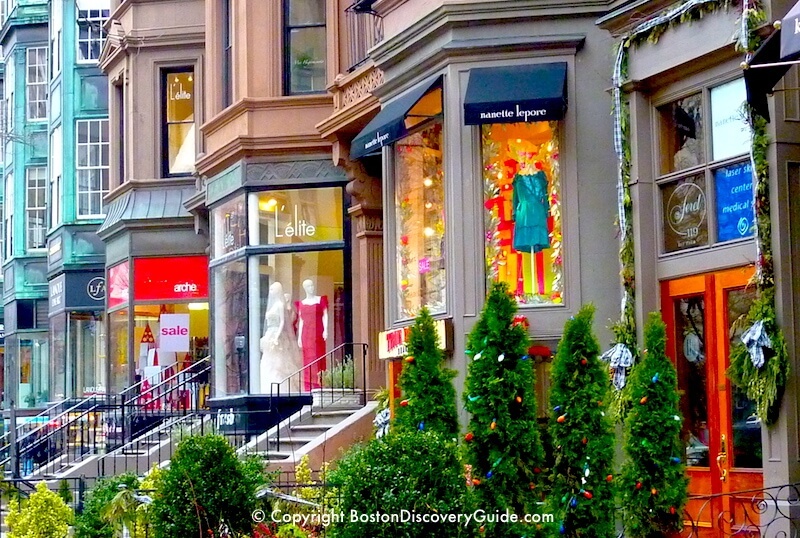 Our recommendations focus on six unique shopping areas: Charles Street on Beacon Hill, Salem Street in the North End, Prudential Center and Newbury Street in Back Bay, Harvard Square in Cambridge, and West Street/Washington Street in Downtown Crossing. Each area has its own specialties - antiques, art, clothing, books, food, jewelry - but also offers a wide range of other possibilities. 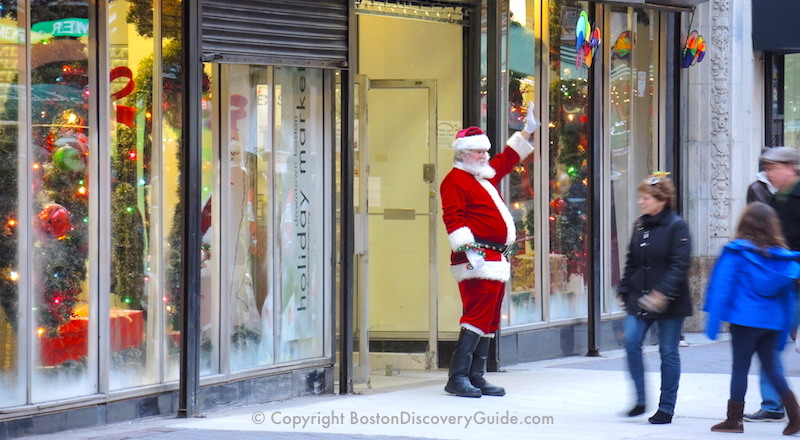 Of course, Boston also has plenty of national brand stores with the latest electronics and sports equipment, discount stores for affordable stocking stuffers, and high-end international designer boutiques for splurge gifts - so we point out where you can find them nearby. Want the convenience of staying nearby? We include hotel information too. 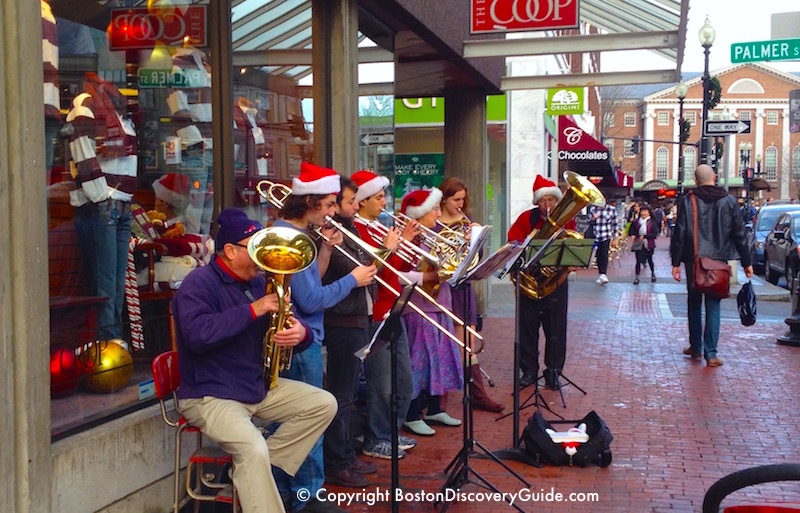 For lovers of antiques, collectibles, art, and vintage jewelry on your holiday shopping list, head straight to Charles Street in Beacon Hill. 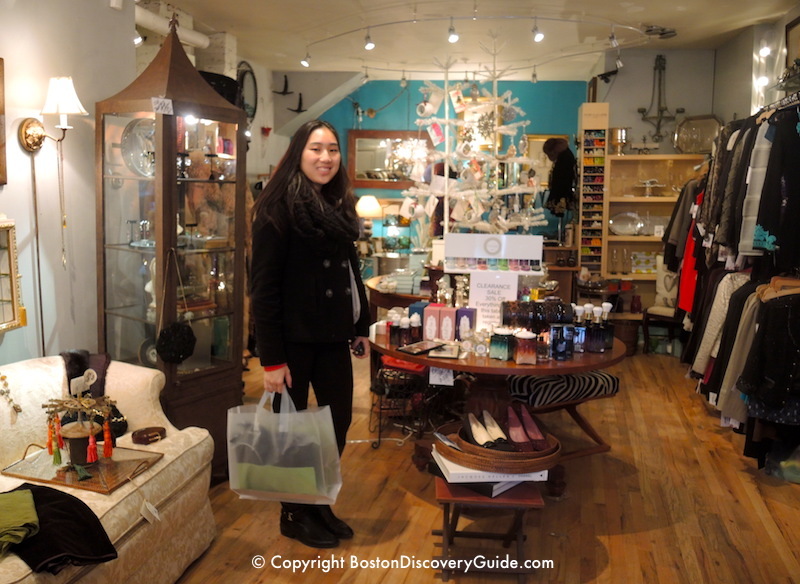 Since Colonial times, Beacon Hill has been Boston's most prestigious address, and the antique stores along Charles Street are where many of the neighborhood's residents furnish their mansions - and then bring back items for resale when a change is needed. Charles Street is only 5-6 blocks long but has more than a dozen antique shops, plus others specializing in vintage, collectibles, old books, and consignment items. You will see a huge range of prices, from affordable to stratospheric. If you're shopping for gifts and don't have an unlimited budget, look for collectibles, old silver, estate and vintage jewelry. 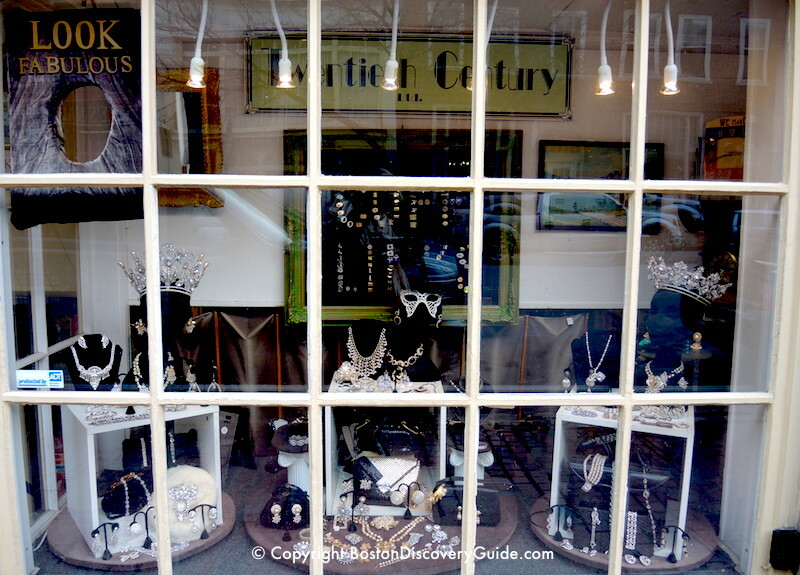 Twentieth Century Limited (73 Charles Street), shown in the above photo, has an amazing inventory of pieces from the last 150 or so years, plus other items such as hats and art prints. Several stores carry lots of personal items such as compacts, hand mirrors, perfume bottles, and pens. Sometimes you'll find very nice old prints for less than you might imagine. For the young at heart, check out the antique toys. For other types of gifts, check out the clothing boutiques, the gourmet chocolate shop, and the eclectic mix of stocking stuffers, toys for all ages, and unique items at Black Ink (101 Charles Street). 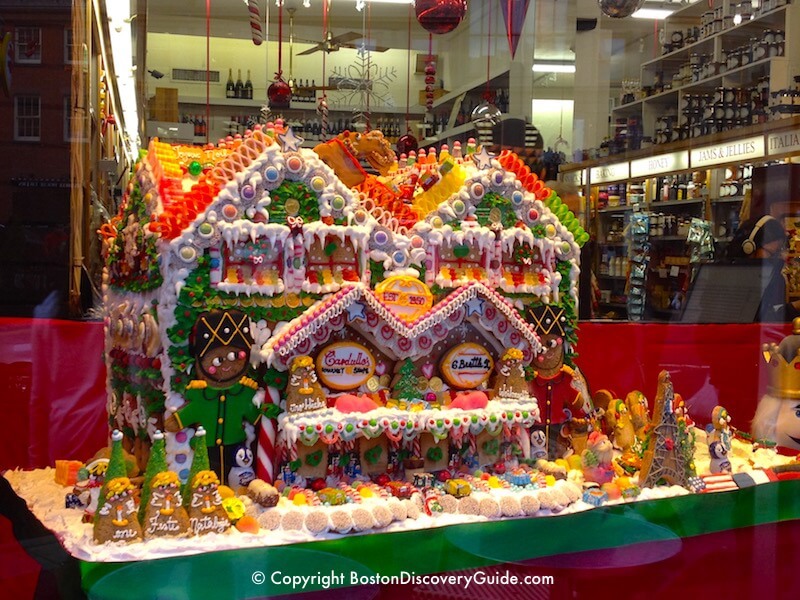 More about what to see and do in Beacon Hill. Walk down Beacon Street past the Massachusetts State House and follow the red line of the Freedom Trail to Faneuil Marketplace - about a 5-minute walk - where you'll find a variety of national brands mixed in with local businesses. A huge Christmas tree and holiday light show adds to the seasonal spirit - more about Christmas in Boston. Upscale stores and restaurants make Prudential Center a popular place to shop and dine throughout the year, but what sets it apart, especially for Christmas shopping, are the two dozen or so kiosks and carts dotting its public spaces. Although you'll see kiosks in many malls, what sets those in Prudential Center apart is the high quality of the merchandise. For gifts, start with the kiosks offering unique Boston-themed merchandise - look for Boston artwork, sports gear, college and university apparel, and mugs. Other carts and kiosks feature jewelry, bags, phone accessories, sunglasses, phone cases, and an assortment of other items. Prices generally fall into the affordable range. 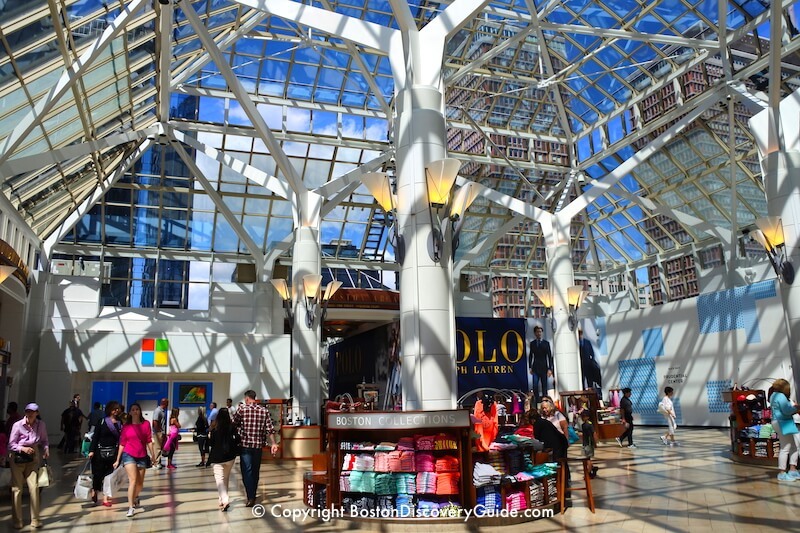 Walk through the skywalk to reach Copley Place, where you'll find lots of international designer boutiques. For the fashionistas on your holiday list or even for those who just want a pair of warm fuzzy socks, head to Newbury Street in the Back Bay neighborhood. The eight blocks of Newbury Street between the Public Garden and Massachusetts Avenue pack in more boutiques and stores than you can count. 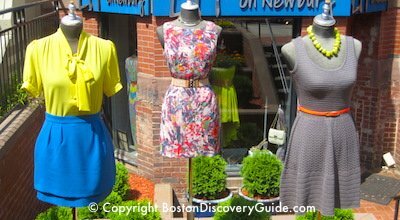 From international labels to national clothing brands to local independent designers to consignment stores, Newbury Street has them all. 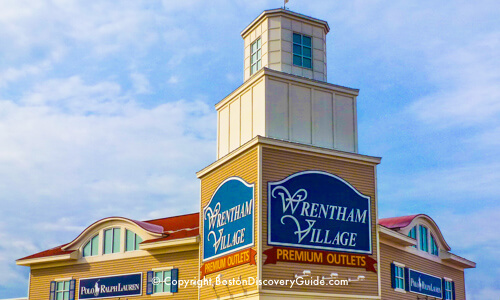 For fashions unique to Boston, visit locally owned stores. 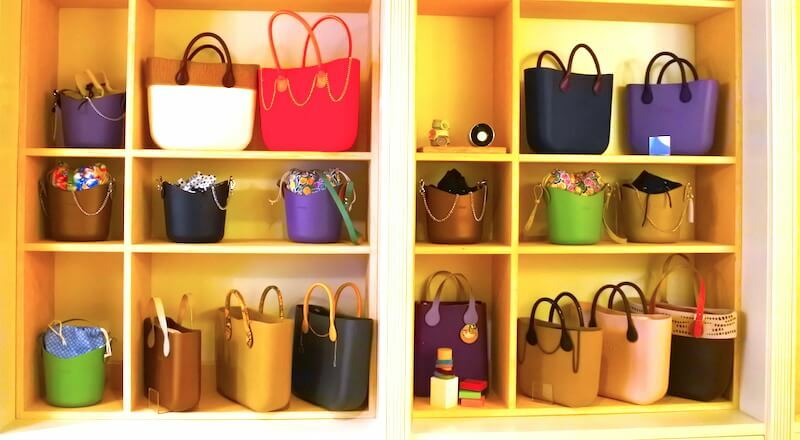 O bag (128 Newbury Street), shown in the above photo, features very affordable Italian-designed bags made from durable EVA for you to customize with your choice of handles, borders, linings, and accessories; buy a couple of extra handles and borders to give one bag many different looks. 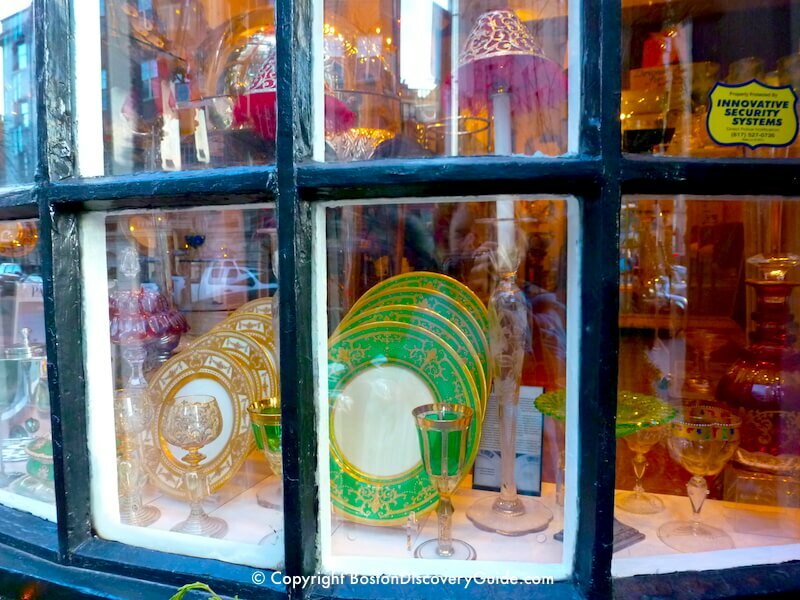 For art lovers on your shopping list, Newbury Street boasts a high concentration of art galleries. Although they carry plenty of museum quality pieces aimed at serious collectors, you'll also find more affordable art than you might expect. International Poster Gallery (205 Newbury Street) specializes in vintage and modern posters from all over the world at a variety of price points. For bigger stores, discounters, and more national brands, head one block over to Boylston Street. Italian food, culture, and heritage define Boston's North End neighborhood, and there's no better place to shop for the food and wine lovers on your Christmas list. Start at Bricco Salumeria & Pasta Shoppe (241 Hanover Street, at the back) or Salumeria Italiana (151 Richmond Street) for homemade pasta, sausages and smoked meats, freshly made mozzerella, fine olive oil, and aged vinegars. For the wine lovers on your shopping list, head to V. Cirace & Son (173 North Street, next to Paul Revere's House), a family-run business here since 1906. They import an astounding selection of Italian aperitivos, digestivos, cordials, and wines; grappa is a specialty. Plus, they have gorgeous gift baskets (or will put together a custom one for you) and beautiful Murano glassware. Prices are quite reasonable. 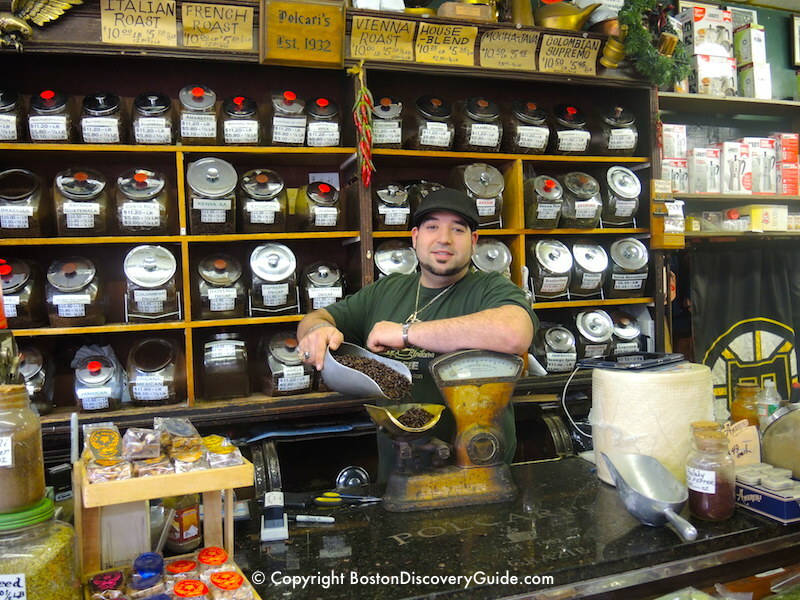 Stop by Polcari's Coffee (105 Salem Street) for the excellent selection of fresh coffee beans and tea. You'll find plenty of other specialty items in this delightfully old-fashioned store, as well as candy and nuts. 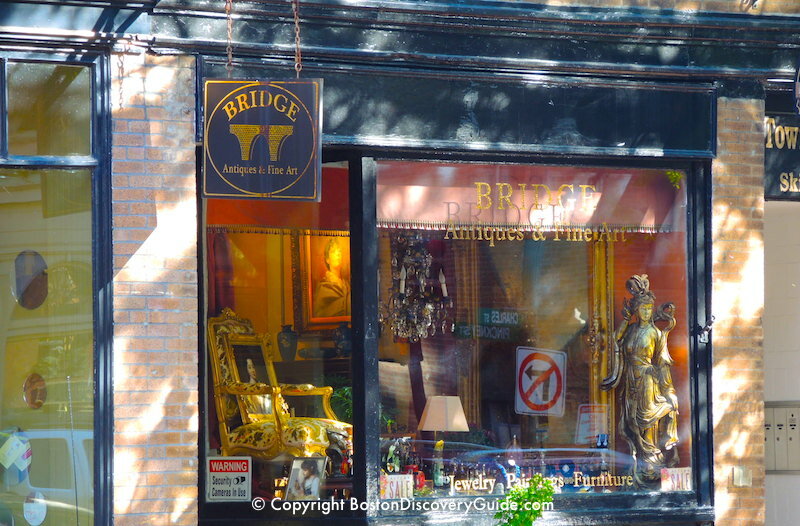 The North End is also where you'll find several small European-style concept stores where you can discover one-of-a-kind artisan and vintage items mixed in with carefully curated collections from less-known brands, giving you an experience far different from online or big-box store shopping. A wonderful place to start is at Ensemble (62 Salem Street), which features an ever-changing collection of gifts, clothing, jewelry, and home decor. Almost directly across the street, Shake the Tree (67 Salem Street) offers a similar concept approach, but totally different styles and choices. Heart and Sole (354 Hanover Street) and LIT Boutique (236 Hanover Street) focus more on fashion by local and emerging designers, and one-of-a-kind accessories. 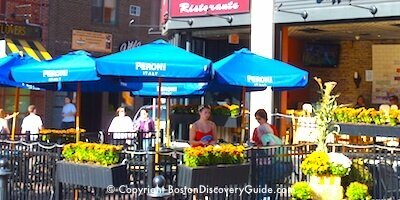 To find more artisinal and New England food and gifts, walk across the Greenway to Boston Public Market (100 Hanover Street) by the Haymarket T Station. This vast indoor market, open year-round, features carefully selected vendors selling the best local products. Go to Boston Honey Company for jars of golden local honey and other special products, American Stone Craft for serving platters and bowls made from slices New England granite-and-mica stones, Mangé for jewel-like bottles of fruit-based vinegar, and Massachusetts Farm Winery and Growers for local wines and ciders. 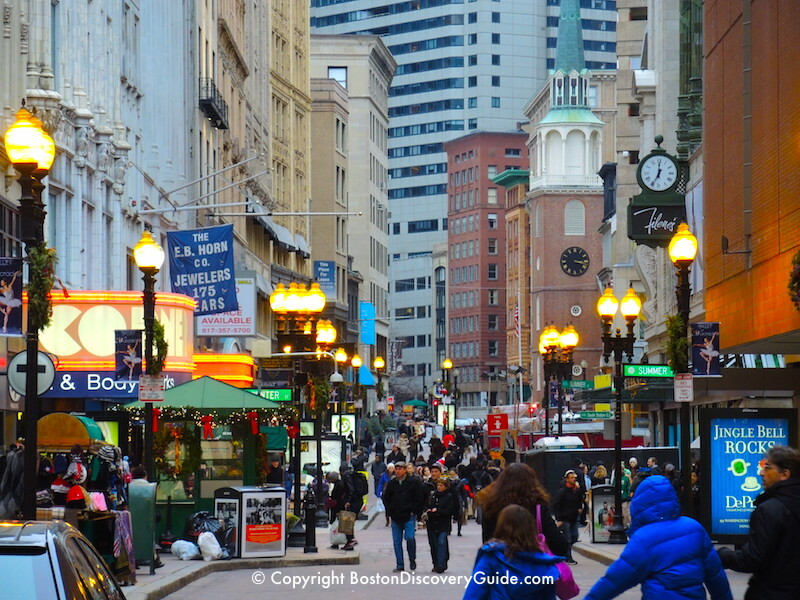 Although an eclectic mix of discounters (TJ Maxx, Eddie Bower Outlet, DSW, etc) and a huge Macy's dominate pedestrian-friendly Downtown Crossing (DTX), you'll find treasures here in two specialized areas: bookstores selling old, rare, and antiquarian books and maps, and jewelry dealers. 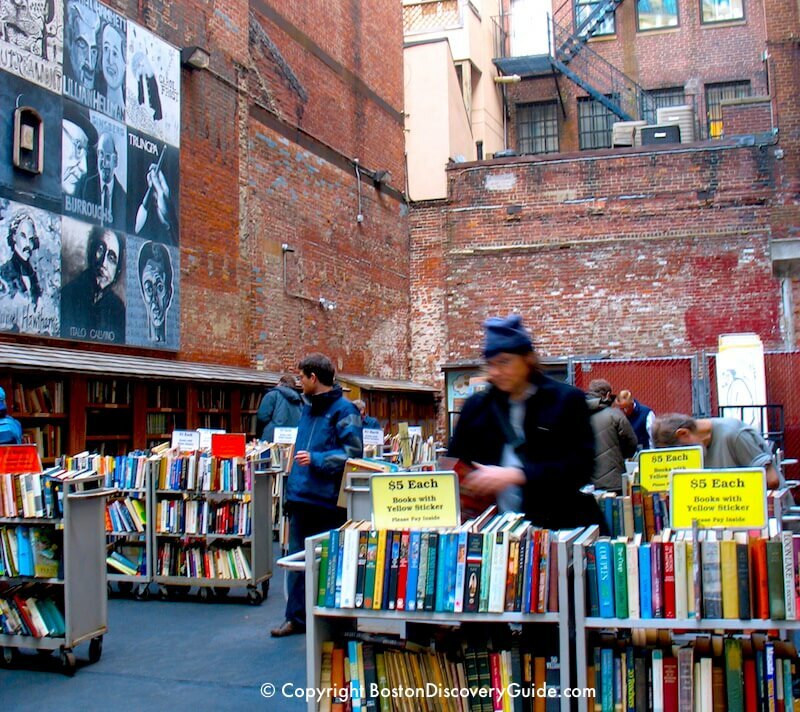 Brattle Book Shop (9 West Street) has been in Boston since 1825, and is one of the largest antiquarian book shops in the country. Over 250,000 books, maps, prints, postcards, and ephemeral items are in stock at all times. You can browse for a $5 used book in their open air market area, or hunt down a special first edition, plus everything in between. Commonwealth Books (9 Spring Lane - incidentally, the oldest street in Boston, dating back to 1630 when the Puritans arrived) is smaller, with around 40,000 titles, but equally compelling. You'll find everything from pages of medieval manuscripts to gently-used recent titles. The bins of old prints and engravings are especially wonderful - some date back to the 1600s. Selections in languages other than English, especially French and German, are usually very good. Fair warning: stop by either bookstore for what you think will be only a few minutes, and you're likely to emerge hours later. Prices at both range from very affordable to what you might expect for first editions and rare collectors' items. Jewelry dealers cluster in a small section of Downtown Crossing that old timers still refer to as the Jewelry District. Most of the dealers are in or near the Jewelers Building (333 Washington Street), home to 150+ independent jewelers including retailers, wholesalers, and manufacturers. If jewelry is on your shopping list, you might as well come to the source. The building is open, 8am-6pm, from Monday through Saturday, although hours may vary for each business. Harvard Square, located across the Charles River in Cambridge (about 10 minutes from Park Station on the subway's Red Line) offers lots of appealing gift possibilities among the student-oriented shops filling the area. For books, music, and Harvard insignia clothing, head to the Coop (1400 Massachusetts Avenue; also entrances along Brattle Street) or Harvard Book Store (1256 Mass Ave). 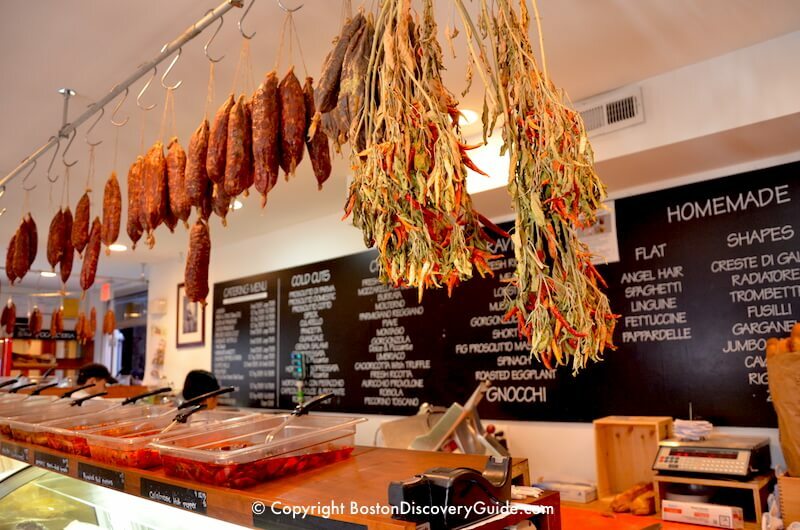 For food gifts, browse the shelves of local and imported gourmet food and wine at Cardullo's (6 Brattle Street). Visit L. A. Burdick (52 Brattle Street) for mouth-watering gourmet chocolates packed in small (or large, if the recipient is especially lucky) wood gift boxes tied with ribbons and a dab of golden sealing wax.